Iron Fist season 2 review: "Hardly a comeback story for the ages"
Marvel’s efforts to improve upon a poor start are appreciated, but Iron Fist season 2 doesn’t do enough to bring Danny Rand out of his hotbed with mediocrity. Every new band fears the curse of the ‘Difficult Second Album’, that niggling worry that they’ll fail to raise the bar set by their own breakout LP. But what if your debut wasn’t any good in the first place? What then? It’s a question Iron Fist season 2 is in the unfortunate position of answering, after its 2016 inauguration was considered a flop on almost all accounts, watched by few and mocked by many, beset by allegations of cultural appropriation and whitewashing. Marvel’s response, for those even interested at this point, is to go away, have a long, hard think, and come back with something… just a teensy bit better than before. Hardly a comeback story for the ages, then. Instead, Iron Fist season 2 brings stronger set pieces and a leaner pace (shortened down to just 10 episodes from Marvel’s usual batch of 13) for something a little more palatable, but still suffers from a dreary script, misjudged characterisation, and a tonally inconsistent performance from its lead star. Despite his short-lived affair with carefree nonchalance in Luke Cage season 2, Danny Rand is back to dealing with self-righteous anger issues in his return to centre stage, as his peacekeeping responsibilities leads to playing fast and loose with the fine line between right and wrong. This might have been an interesting direction for the character after his fish out of water schtick in Iron Fist season 1, had it not been exactly the same arc that Daredevil, Luke Cage, and Jessica Jones went through in their respective second seasons. Sadly, Rand’s inner struggles with the blurry ethics of vigilantism are now something viewers of these shows will be all too familiar with. We get it, Marvel, superheroes are humans too, but humans do have other flaws beyond our penchant for power trips, y’know. Repetition is also where Iron Fist season 2’s wider story trips up, which is again a back and forth goose chase of nebulous gang wars, mystical macguffins, and an arch-nemesis’ pursuit for God-like powers, all leading up to a final showdown between hero and villain. The show even brings back an old season 1 antagonist in Davos, Danny’s former K’un-Lun frenemy, who’s suffering from a serious case of fraternal jealousy. Sacha Dhawan plays it straight to reflect the character’s steely stoicism, but that leaves him the one-note charisma vacuum he’s always been, just with even more screen time to soak up the energy of every scene. Kilgrave and Kingpin have nothing to worry about; their position at the top of the Marvel TV villain food chain continues unchallenged. At least the rest of the supporting cast fare somewhat better. Colleen Wing is as much the lead character as Danny at this point, with her season 2 arc culminating in a twist that genuinely left me curious to see where she's headed in future Marvel shows. Alice Eve, whose role I won't spoil here, is clearly having fun subverting expectations, albeit with ill-defined purpose to the overall story, while Danny’s surrogate siblings Ward (Tom Pelphrey) and Joy Meachum (Jessica Stroup) offer both laughs and heart wrenches with a smartly devised role reversal since season 1. If you're planning on sticking around for future Iron Fist seasons, it's because of the show’s ensemble prospects, and not Danny Rand. A lot of fuss has been made by Marvel about the pains it's taken to improve Iron Fist’s fight scenes since the first season, with Stunt Coordinator Clayton Barber (whose credits include Black Panther and Creed) taking a more active role on choreography duties this time around to bring some much needed punch and pulp to the, uh, Iron fisticuffs. The investment has clearly paid off, as action scenes are no longer sanitised, chopped up takes of glorified arm waving, but martial arts-infused skirmishes, which are almost (emphasis on “almost”) equal to the slick punch ups that first made everyone fall in love with Daredevil back in 2013. It’s one of Iron Fist’s biggest improvements since season 1, and something that deserves to be recognised even if its impact on the show’s overall quality is modest at best. As for how it all ties to the wider Marvel Netflix-verse, or indeed the MCU at large, Iron Fist season 2 sticks to the same tract as recent seasons of Luke Cage and Jessica Jones by keeping its story relatively isolated, for better or worse. Simone Missick is always an enjoyable presence as Misty Knight, this season’s big crossover thread to Luke Cage, taking over from Claire Temple as The Defenders’ show-hopping ‘fil rouge’ now that Rosario Dawson’s on indefinite hiatus from her Marvel TV duties, but that’s about it for any longtime fan service (save for one, post-credits scene in the finale, which also happens to be Iron Fist’s strongest episode to date). On the one hand, you have to respect the showrunners’ decision to maintain a level of restraint, focusing on organic storytelling instead of hackneyed allusions to the wider universe of superheroes, gods, and those pesky Infinity Stones. Yet, on the other, this limited scope only compounds Iron Fist’s main problem of feeling like a throwaway story with little bearing on anything beyond its treacly world of distastefully restructured Chinese mythology. If season 2’s plot had been more arresting, this wouldn’t have been a problem. With the way things are, exploiting its comic book connections could have endowed Iron Fist with the greater sense of scale and purpose it so desperately needs. So, season 2 is a step in the right direction for Iron Fist. Unfortunately, that step is essentially a mere tip toe ahead of a terrible start. 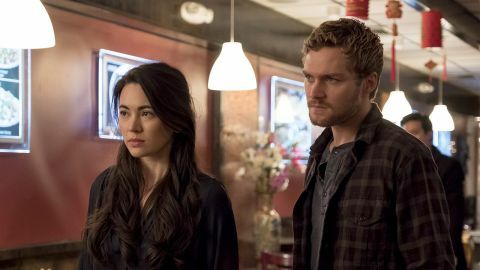 Danny Rand remains as bland and unengaging as the story around him, with Finn Jones stuck to a script unsuited for his boyish demeanour (“Apologise, before I break your face” he says at one point, in the most laughably unconvincing manner possible). It’s a shame, given what was teased for the character before now, but Iron Fist’s second season is just another addition to the growing pile of disappointing follow-ups for Marvel’s Netflix heroes. Disappointed with Iron Fist? Cleanse your TV palate with one of the best shows on Netflix right now.